My friend Chris Joye has been writing for the AFR for about a year, and has just had his first breakthrough story. 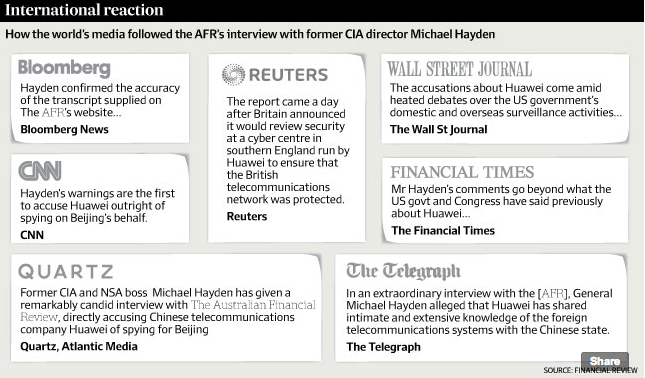 His interview with the former head of the US Central ­Intelligence Agency and National Security Agency, Michael Hayden, created quite the splash, and was picked up around the globe. The picture below highlights a few of the more known media outlets that picked up on the story — this AFR story gives the scoop on the splash. For those wanting more, see the full transcript, the expert response, and the story about the decision to keep Huawei away from the NBN. This entry was posted in Australian Politics, China and tagged Huawei, Joye. Bookmark the permalink.